On the surface, this was the ultimate “make or miss” game. Golden State nailed 24 of 45 uncontested shots, according to NBA.com. Harrison Barnes and Andre Iguodala nailed the open corner 3s they had missed in prior games, and Draymond Green coaxed in a few of those floaters Timofey Mozgov had previously obliterated — including a ferocious chest-to-chest and-1 in the second quarter. The Cavs, meanwhile, went a frigid 6-of-29 on uncontested looks, emboldening the Warriors to take an extra step away from Matthew Dellavedova and Iman Shumpert in order to squeeze LeBron James. Golden State coaches and officials were adamant after the game that going smaller had reinvigorated the team. The Warriors felt like themselves again, scrambling around the floor on defense, scrapping for gang rebounds — Green says the team’s guards are more attentive when they know he’s the only big man under the rim — and at least trying to rush the ball up the floor. The starting lineup might have flailed around, but small-ball groups with Shaun Livingston played nearly half the game, and they scorched the tired Cavs. The floor gets tight when the Warriors play Livingston, Iguodala, and a traditional center; going super-small, with Green at center, is a way to get their two shaky-shooting Swiss army knives out there together — without killing their spacing. The Cavs closed most of the gaps in Game 3, but not all of them, and the Warriors were confident they could crack them open a bit wider if they stuck with it — especially once they decided to bench Bogut, spread the floor, and drag Mozgov one step further out of his comfort zone. Curry loses Dellavedova on a Barnes pin-down, but instead of searching out his own shot, he leverages the advantage by sprinting into a pick for Livingston. 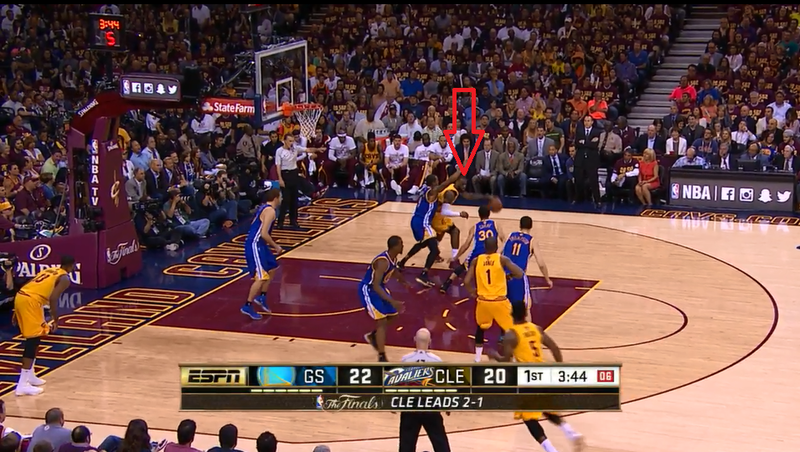 That catches the Cavs off guard, allowing Livingston to drive and find David Lee. Sometimes the most powerful screener is the guy everyone expects to shoot. Kerr anticipated that Mozgov would ignore Iguodala when any other Warrior had the ball, so he made sure Iguodala remained an active part of the offense. When Iguodala caught Mozgov drifting toward the rim, he would rush to set a pick for Curry — forcing Mozgov to scurry behind him and try to contain Curry at the 3-point arc. That’s dicey territory for the big fella, and Curry was able to thread pocket passes to Iguodala — leaving Iguodala to slice up the defense in the 4-on-3s Golden State had thrived in until this series. If the Cavs keep Mozgov on Iguodala, the Warriors would do well to expand Iguodala’s role even further — let him run pick-and-rolls, push the ball in transition, and perhaps even try to take Mozgov one-on-one. Curry didn’t go nova last night, but he found the right balance between passing out of double-teams and hunting for his own shot. 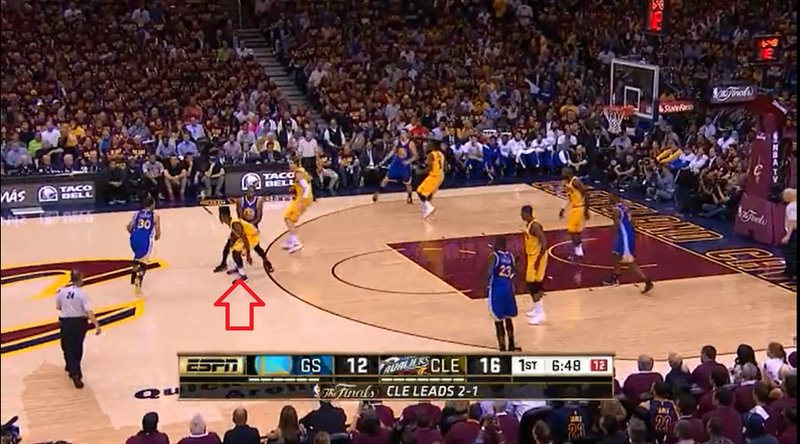 He split some traps on drives to the rim, and he attacked Dellavedova one-on-one without the aid of any pick. 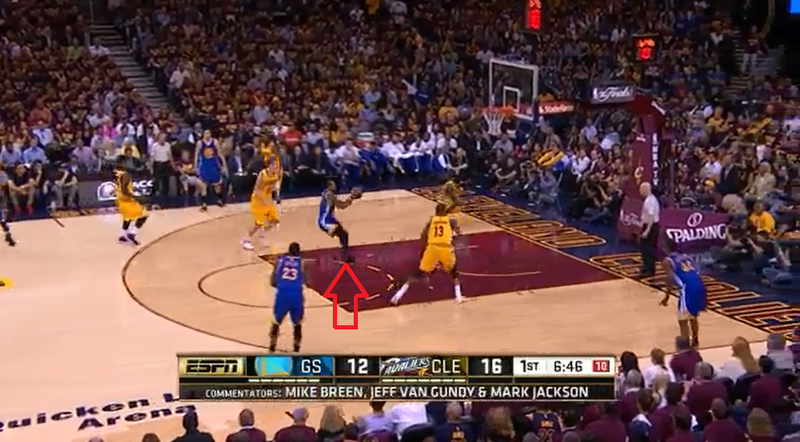 And, holy hell, did Curry punish the few switches he generated on the pick-and-roll. He nailed step-back 3s over Tristan Thompson and James Jones, and it’s clear now that switching a big onto Curry is untenable. It is merely the moment before fire. Golden State is also starting to read how the Cavs are helping from unconventional places. On most pick-and-rolls, help defense comes from the weak side — but Cleveland isn’t following those rules. If Klay Thompson is on the weak side, it isn’t helping off of him; it will send help from a less dangerous shooter in a more dangerous position — the strong-side corner, closer to the initial pick-and-roll. Livingston played a masterful all-around game, and the Warriors found their spirit against a team that had ground it into dust for three games. We’ll see if it lasts. Kerr knows he is taking a major risk going small against the behemoth Thompson-Mozgov front line. The Cavs rebounded 30 percent of their own misses, and a monstrous 36 percent in the 27 minutes their two bigs shared the floor — a span in which Cleveland was plus-1 overall. The Cavaliers couldn’t sustain their defense for the full game, but they brought it in spurts — especially at the start of the third quarter, when they denied passes so precisely that Iguodala, holding the ball, simply shrugged his shoulders and jacked two long jumpers he didn’t want to take. With two days off before Game 5, and another potential two-day break before Game 7, perhaps the Cavs can summon the energy to play that way for entire games again. Shumpert especially needs to seize a more active role. 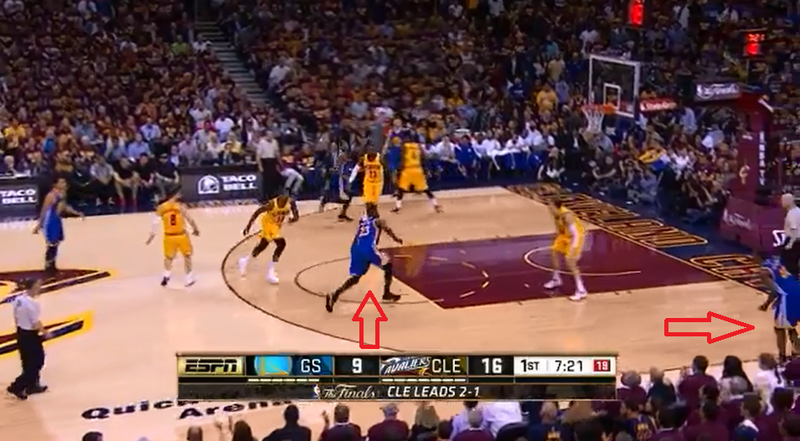 The Cavs cannot gift Curry the chance to hide on Shumpert. When Curry is on Dellavedova, the Cavs pivot right into James/Delly pick-and-rolls; they should use Shumpert more in that same way when Curry is on him. Cleveland should also keep right on posting up Mozgov against Green, Barnes, and whatever Lilliputian Mozgov encounters. Mozgov has nimble feet, a soft touch, and an angry streak in backing those little dudes all the way under the damn rim. The Warriors mixed in some fronts, even drawing a three-second violation as the Cavs pinged the ball around in search of an open passing angle, but Cleveland shouldn’t shy away from its size advantage. The Cavs have done periodic damage spotting up Jones as a small-ball power forward around LeBron pick-and-rolls, but it hasn’t been enough to really hurt Golden State, and when Jones is your best small-ball bench option, you’re probably not equipped to beat Golden State in a small-ball series. That is where the Cavs really miss Kyrie Irving to maximize the punch in their small-ball lineups. But the Cavs, even in this limited state, are equipped to beat the Warriors. They have proven that. They’ll have to do it once more on the road to win what has turned into an intriguing, and potentially epic, NBA Finals. • Watch the cross-matches in Game 5. Iguodala is guarding James, but the Cavs have James guarding Barnes. The Cavs got two early transition baskets, including a Mozgov dunk, while the Warriors were scrambling around trying to find their proper assignments. Golden State got one back when Green brought the ball up and found no one guarding him, since his guy, Tristan Thompson, had picked up Iguodala amid the offense-to-defense confusion. These little games-within-the-game can decide things. • Kerr seems to have concluded that Iguodala is his only workable option on LeBron. When he saw the Cavs insert LeBron early in the second quarter while Iguodala was still on the bench, Kerr immediately burned a 20-second timeout to get Iguodala back in. Kerr confirmed to me afterward that he used the timeout specifically for that purpose, rather than risk even one possession with Barnes on LeBron. • Kerr didn’t repeat the mistake he made at the end of the first half in Game 3, when he left Ezeli in to guard Jones for the last Cleveland possession. When he saw that the Cavs had inserted Jones, Kerr swapped in Barnes for Lee. • It’s unclear if James can even come out at this point. The Cavs were minus-6 in the seven minutes James sat, and they have zero offense without him. Their non-LeBron offense resembles how Golden State might look without talent — a bunch of guys running around, cutting, and screening, producing no usable advantage. • Curry, meanwhile, played the whole second half until garbage time — a huge departure. I loved that. • The degree to which Golden State is playing Dellavedova to pass on the pick-and-roll, and specifically to toss a lob pass, is getting comical. Both defenders shade toward Tristan Thompson, conceding a floater. 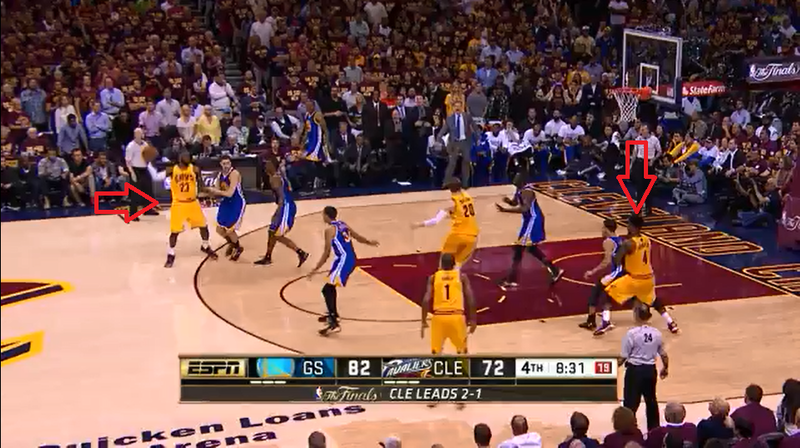 Dellavedova nailed three such floaters in Game 3, but he lofted a couple of no-chance-in-hell lobs in Game 4. • The Cavs’ home gold jerseys swirling around against the Warriors’ road blues is a wonderful visual experience. • Fun postgame moment: I was in the hallway outside the Warriors locker room, gesturing with my hand to describe a pass one Golden State player had thrown. I stuck my right hand out, and a man passing by at that exact second thought I was reaching for a handshake. He extended his hand to shake mine, realized I had not meant to ask him for a handshake, smiled, and held his hand out until I finally shook it. • Usher used a gold microphone to sing the national anthem. Does he always use a gold microphone? • Curry has an underrated on-court pouting game. He balls up his fists, holds them at waist level, and shakes them as he hops up and down. • A career highlight: seeing Ric Flair at center court during a commercial break, sporting a trademark Nature Boy robe — Cavs gold, with dark red feather trim. WOOOO! • They showed my old friend Machine Gun Kelly, the Cleveland-based rapper, on the big scoreboard, and flashed Kelly’s name underneath his face. Michael Strahan was sitting next to him, but the scoreboard operators did not acknowledge him. OH, SNAP! They undid the error a few commercial breaks later, going back to Strahan and giving him the proper treatment. • Can we move the freaking photographers back a few feet behind the baseline? What is it going to take for this to happen? • A little thing I love about Mozgov’s game: He’s really good at disguising the direction of his pick until the very last moment, and even flipping directions in an instant. He tricked Iguodala a few times on LeBron pick-and-rolls; Iguodala lunged one way, thinking Mozgov’s screen was going to send James in that direction, and fell hopelessly behind when Mozgov set that sucker the other way. Reminder: Mozgov is under contract for just $4.95 million next season. Cavs GM David Griffin did a sensational job rebuilding this team on the fly during the season. • I’m always impressed at how quickly teams edit highlights into the pregame montage to pump up the crowd before the introduction of the starting lineups. Tonight’s was filled with clips from Game 3, but the Cavs wisely kept LeBron’s screaming touchdown spike from Game 2 in the anchor spot. 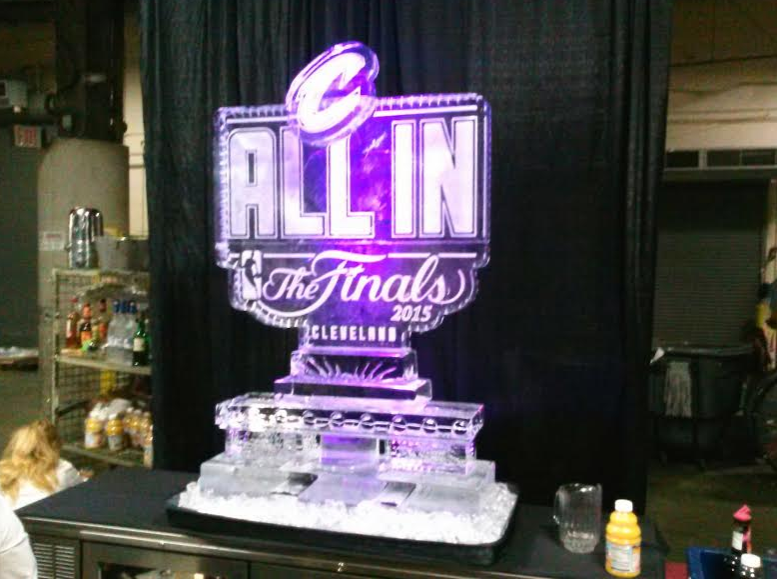 • Speaking of anchor spots: Hurrah for LeBron relishing his place at the end of Cleveland’s lineup introductions. The man gets theater. He waits for the announcer to call his name, rises slowly from his chair, and jogs out — alone, owning the moment. That lineup averaged about 95 possessions per 48 minutes, just one possession higher than the series average through three games, per NBA.com.